... Australia risks becoming not “home” but a host community. They show that up to 40 per cent of Auburn and Lakemba identify as Muslim. There are also large Muslim populations in Greenacre (30.7 per cent), Silverwater (27 per cent), Roselands (22.1 per cent), Arncliffe and Turrella (21.7 per cent), and Bankstown (21.6 per cent). Ethnic and religious forces converge in Cabramatta, where more than 40 per cent of the population identify themselves as Buddhist and Vietnamese. Bolt's emphasis is on what he sees as a Muslim "ghetto" in various south-west Sydney suburbs. Yet Vietnamese, Buddhist and Jewish communities aren't excluded from his slur. Still, Bolt has done his readers a favour by showing that when it comes to discrimination, he prefers not to discriminate. Other prominent American Obama smearmongers and their critics are linked here. But what would the New York Times and the Boston Globe know? According to the Daily Telegraph's seasoned political expert Tim Blair, the real person behind the Obama smears isn't Daniel Pipes and/or Andy Martin. 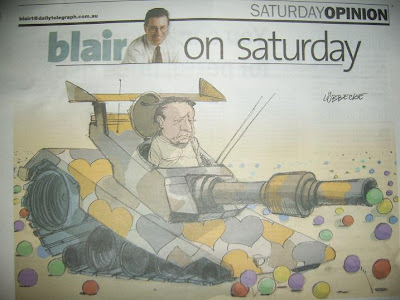 Rather, the smear merchant is none other than Australian pollster Malcolm Mackerras. It isn’t conservative bloggers who are fixated on Obama’s race ... but certain leftish pundits. Yep. Mackerras is the culprit. Mackerras has been accusing Obama of lying about his education at a Jakarta madressa, about wearing a sarong, about being exposed to the Koran. Mackerras has been making an issue of Obama's middle name. When you click to watch the video above, imagine it's Malcolm Mackerras. Surely after such imbecilic commentary appearing on the Daily Tele's official website, editor-in-chief David Penberthy might recommend a secondment for Blair - to Fox News. I'm sure Blair and Bill O'Reilly would be a scream.